Free in the jungle, Pia meets Eio, a boy from a nearby village. 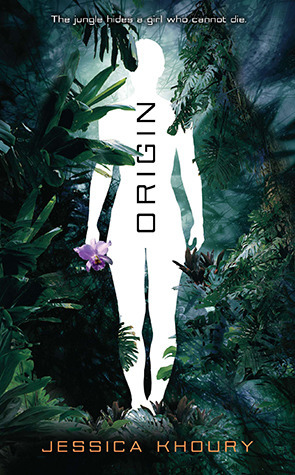 Together, they embark on a race against time to discover the truth about Pia's origin--a truth with deadly consequences that will change their lives forever.Origin is a beautifully told, shocking new way to look at an age-old desire: to live forever, no matter the cost. Being that this book will be on this year's Breathless Reads Tour, I thought that I might as well read it because it's gotta be a great book, right? The concept for the book is incredible! It's such and original and scary idea to tackle as an author, I think. Sure, there's plenty of immortal characters in books (vamps, faeries, ect.) but what if there's only one person that's immortal? Doesn't that sound so lonely? Also, while books may touch upon this topic of the immortal lonely life, you don't exactly get the surreality of it, do you? Sadly, given the high expectations I had for this book, I was let down. I can't tell you how many times Pia got on my nerves. Personally, I have no time for people who completely deny everything told to them that they happen to not like and their naivete. Pia has both of those characteristics that made it hard for me to enjoy and relate to her. She did grow as a character, but it took her until the very, very, very end to get there. I understand that being raised in isolation and being fed lies made her very inexperienced to the world, but her down-right denial bothered me to no end. Eio. Oh, Eio, how did you even fall in love with Pia? How can you even handle her personality? You're such a sweet boy with your romantic words, and that shirtless quality about you is just phenomenal, but I think you could have done better! Plus, your insta-love situation was not only unrealistic, but cliche and bothersome! I didn't buy it. Dude, you barely even know the chick, and for most of the book, she caused you nothing but problems to you and your village! I get that you're single and not all the ladies in your village are attractive, but are you that desperate? The book for the most of it dragged. My heart wasn't into the story, mostly with Pia and the insta-love ruining it for me. I was curious to see how it ended, but getting there was a little tough. The only reason why this book received 3 instead of 2 stars would be because of the incredible imagery. It was so vivid and I felt like I was being transported to the jungle along with the characters. Truly, it was heaven for me. I'm not sure where I was going with this when I had written it in my review journal, but "Scientists=Nazis". There it is. Origin was a book chock-full of vivid, magnificent imagery, but other than that, the entire book fell flat for me. I'm content with this one staying a standalone, mostly since all the problems were concluded by the end. I still like the idea of immortality and how it effects other--emotionally--but this book did not become a favorite of mine. This extremely saddens me, since I was excited for it because of the Breathless Reads Tour. Aww, I'm sorry that you didn't like it, Millie! It does have a really fantastic premise, but I understand getting your hopes way up and then...BAM. Just killed hopes. But...dang. Insta-love and annoying main characters? That would probably kill me too. Ick. LOL, none of the women in his village are attractive? Teehee. That's got to impossible. Great review! Sorry you didn't enjoy this one more. I agree though that the imagery was great in this book and I'm happy it's a standalone. uh.. I never really intended to read this book, because I somehow have a feeling i wont enjoy it. Pia does sound like an annoying character.. Great honest review!